The Notrax 550 Cushion-Ease Anti-Fatigue Mat features large holes for liquid and debris drainage and a multi-nib back for enhanced anti-fatigue properties. The Notrax 550 Cushion-Ease safety mat is available in either grease resistant black rubber or grease-proof red nitrile rubber. The Cushion-Ease mat features squared off edges that interlock to each other; use optional Notrax 551 ramps and connectors to create a custom, on-site mat solution. 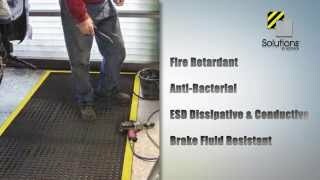 The Notrax Cushion-Ease 550 anti-fatigue mat resists oils, cutting fluids, chemicals and grease, making it an excellent mat for food preparation or service areas, as well as industrial settings where anti-fatigue properties and drainage are important. The Notrax 550 Cushion-Ease Anti-Fatigue Mat is available in two sizes: 3' W x 3' L and 3' W x 5' L.
The Notrax 550 Cushion-Ease Anti-Fatigue Mat is available in black or red.